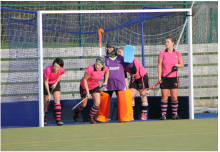 Jaspers Ladies Hockey Club is based in Bristol. We have two teams and always welcome anyone who would like to play, umpire or support us in any way. Please get in touch if you would like to join us. Latest News is available on our Facebook page. You can also follow us on Instagram and Twitter. We're moving 'home'! ​We are moving both training and match day locations, please check out our new home by clicking here. Do you fancy playing hockey? We are actively looking for new players of any ability to join our hockey family. Please contact us to have a chat about how to get involved! Please help us raise funds! By using Easy Fundraising to do your shopping (for Groceries, insurance, Amazon etc) you can raise funds for your favourite hockey club without costing you a penny more! Click here for more info. Jaspers LHC was born in 1981 and founded by a group of friends as a result of a successful touring side. The club has always had a strong social emphasis and has maintained that ethos throughout the years. Over the years that we have been in action we have also run an indoor team and participated in a floodlit league. Gradually we have increased our membership to now run 2 league teams. One of our most famous members was Lucy Culliford who started playing for Jaspers at the age of 13 and eventually went on to play for England and the Great Britain squad. For opposition teams trying to find out our playing colours, our home kit is pink and black. Away kit is white and black. 2014/15 North Division - 1st and Promotion! 2014/15 Brunel Division 2 - 2nd and Promotion! 2010/11 Brunel Division 3 - 2nd and Promotion! We link to YouTube to bring you our videos, and they add advertisements. These are beyond our control and we do not endorse any product or service that may appear.